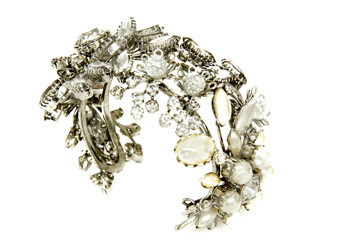 Obsession of the Day: Tom Binns Jeweled Flower Cuff | Fashion. Style. Beauty. | Life is short. Live well. I know what you’re thinking: wow, that’s kind of costly. C’mon, Kristin, really? My answer is yes, it’s expensive because brilliant craftsmanship costs money. Every once in a while, I feel like it’s good to lob investment pieces over the wall because when you have something this beautiful, this well-made and this striking, it’s meant to last a lifetime. On a less fashion-y note, it’s just so PREEEETYYYYYYY…..